AIPAC CEO Howard Kohr onstage at the 2018 AIPAC Policy Conference. Photo courtesy of AIPAC. SENIOR FIGURES affiliated with America-Israel Public Affairs Committee, known better as AIPAC, are preparing to launch a new political group called Pro-Israel America to steer smaller-dollar political donations toward pro-Israel candidates, according to a February strategy document obtained by HuffPost and Jewish Currents. Pro-Israel America hopes to recruit 10,000 donors giving around $200 each in order to send at least $2 million to pro-Israel candidates during the 2020 campaign cycle. AIPAC has no obvious formal ties to Pro-Israel America, but the new group’s executive director, Jeff Mendelsohn, served as AIPAC’s director of outreach from 2005 to 2016. The group’s organizers plan to unveil it at AIPAC’s Policy Conference later this month, according to the strategy document. Alongside the recently announced Democratic Majority for Israel — which plans to set up a PAC for campaign donations later this year and is also stocked with friends of AIPAC — the launch of Pro-Israel America marks a new phase of activism for the Israel lobby as it aims to remake itself for a new era in which progressive politicians have raised huge sums from small-dollar donors. AIPAC and its allies had to make a change. Democratic voters are drifting from previously staunch support for the Israeli government, according to public opinion surveys, and recent left-wing electoral victories indicate a sea change on Israel within the Democratic Party itself. People who “do not value the U.S.-Israel relationship in the same way are becoming more organized and have new outlets for their contrary viewpoints,” the document’s authors warn. The Israel lobby’s turn toward small-dollar donations represents an acknowledgement of this changed political reality. Groups as diverse as Christians United For Israel, the Israeli American Coalition for Action, and the Zionist Organization of America already spend huge sums on pro-Israel lobbying and politics in the U.S. Pro-Israel donors spent over $22 million on lobbying and campaigns during the 2018 election cycle, the Guardian estimated in February. AIPAC, the biggest organ of the pro-Israel movement in the U.S., raises around $100 million a year from its donors. It spends most of that money on activities like lobbying junkets to Israel for politicians rather than direct political contributions. AIPAC does not itself technically raise money for political candidates. But it operates a powerful and influential network of donors whose effective deployment of dollars has long been the envy of the Beltway. AIPAC offers these donors “exclusive membership benefits” for giving money to particular pro-Israel PACs or directly donating to preferred campaigns, as Sludge reported in February. Pro-Israel America will endorse candidates, particularly when “pro-Israel members of Congress or candidates face competitive races and/or where one candidate is clearly more pro-Israel than the other,” according to the document. It will also create a web portal so donors can send contributions to specific campaigns. Neither Mendelsohn of Pro-Israel America nor spokespersons for AIPAC replied to requests for comment. 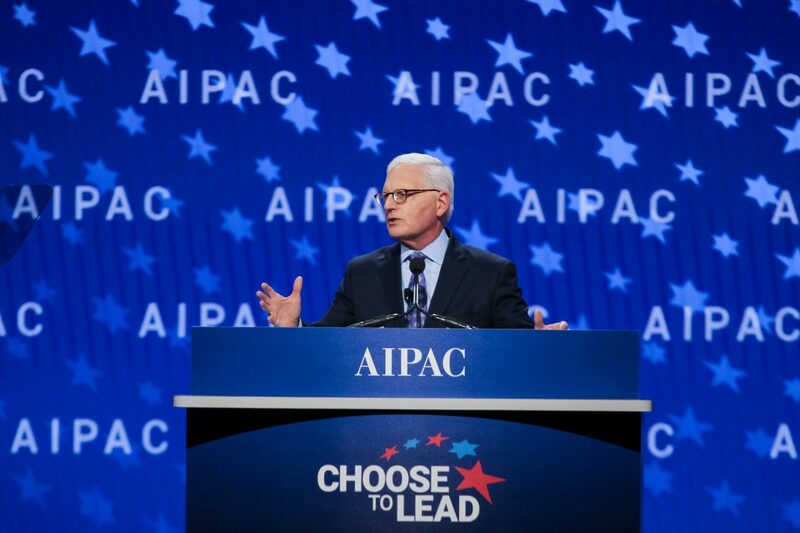 Creating a group like Pro-Israel America represents a huge strategic shift for AIPAC. For years, AIPAC has been able to publicly put distance between itself and the large sums of money that pro-Israel donors marshal on behalf of preferred candidates. By supporting new groups like Pro-Israel America and the Democratic Majority For Israel (whose leadership is also replete with old AIPAC hands) — and giving them prime placement at its flagship conference — AIPAC is publicly linking itself to the kind of election cycle work it has long kept at arm’s length. AIPAC and its allies now face direct political opposition on Israel policy they have not encountered for years, and backed by funding sources with which they have no influence. Those include high-profile new members of Congress like Reps. Rashida Tlaib (D-Mich.) and Ilhan Omar (D-Minn.). Omar was recently taken to task by the Democratic leadership for suggesting that AIPAC dollars were behind Republican zealousness to silence her, and will face a House vote on Wednesday brought by Democrats to condemn her.